Sjögren-Larsson syndrome (SLS) is an inherited neurocutaneous disorder caused by mutations in the aldehyde dehydrogenase family 3 member A2 (ALDH3A2) gene that encodes fatty aldehyde dehydrogenase. Affected patients display ichthyosis, mental retardation, and spastic diplegia. More than 70 mutations in ALDH3A2 have been discovered in SLS patients. We diagnosed two brothers age of 12 and 20 years with characteristic features of this rare syndrome. 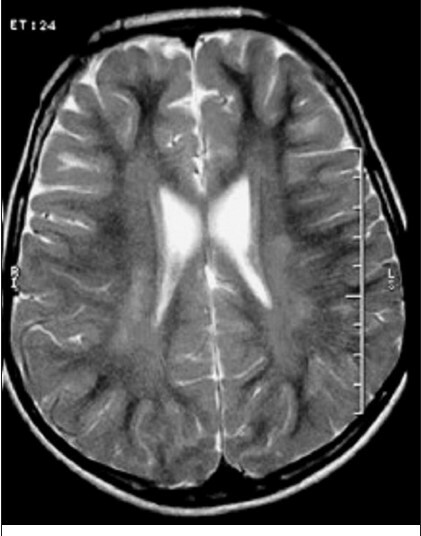 Magnetic resonance imaging showed demyelinating disease in both of them. We described a novel homozygous, c. 835 T > A (p.Y279N) mutation in exon 6 in two patients. In the present study, we report homozygous novel mutations in ALDH3A2 in a Turkish family with SLS. Index patient was a 12-year-old boy who was admitted to the hospital for generalized dryness of skin and developmental delay. He was moderate mentally retarded and unable to walk. He was the second child of healthy consanguineous parents. He had delivered at pre-term (32 weeks of gestation) by normal vaginal delivery. There was no history of maternal diabetes or exposure to any teratogenic agent during the pregnancy. Birth weight, length, and head circumference measurements were unknown. He had first evaluated for delayed walking at 2.5 years of age and cerebral magnetic resonance imaging (MRI) had detected symmetrical white matter lesions. The diagnosis was spastic diplegic type of cerebral palsy, which resulted from premature birth and MRI findings. He had global developmental delay and he had generalized seizures since 7 years of age that had been controlled with valproic acid treatment. Physical examination showed generalized dryness of skin most predominant around the umbilicus and on the bilateral lower limbs [Figure 1]. The face, palms, and soles were affected, but the nails and teeth appeared normal. Skeletal abnormalities (e.g., short stature, kyphoscoliosis) were not observed. Neurological examination revealed moderate mental retardation, and spasticity. The deep tendon reflexes were brisk in the lower limbs and he had muscle weakness of grade 3/5 in both lower limbs and could not walk. Ophthalmologic examination was normal. In laboratory, metabolic investigations including, serum lactate, pyruvate, tandem mass spectrometry, urine organic acids, and phytanic acid revealed were normal. His electroencephalogram (EEG) showed symmetrical slow background activity without other abnormalities. MRI of the brain showed diffuse and symmetrical high-signal intensity in bilateral deep periventricular white matter in the corona radiata [Figure 2]. The patient was the brother of case 1. He had had severe ichthyosis on the entire body since birth, especially, prominent on the bilateral lower limbs. He showed mental retardation and spastic tetraplegia. He was delivered at full-term by normal vaginal delivery. Birth weight, length, and head circumference measurements were unknown. At the age of four, he evaluated for delayed walking. MRI of the brain had performed and revealed periventricular white matter abnormalities. The diagnosis was cerebral palsy due to clinical and MRI findings. He had begun tip-toe walking at the age of 5 years, and his gait was spastic and walking in smooth floor. 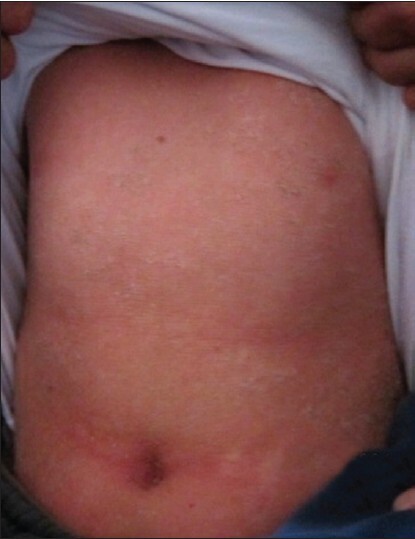 Cutaneous examination revealed generalized ichthyosis on the entire body. The face, palms, and soles were affected, but the nails and teeth were normal. There were no skeletal abnormalities. In neurological examination, he had mental retardation and spasticity and his gait was spastic with brisk deep tendon reflexes in the lower limbs. The patients had grade 4/5 power in both lower limbs. Ophthalmologic examination revealed bilateral glistening dots on the macular region of the retina. 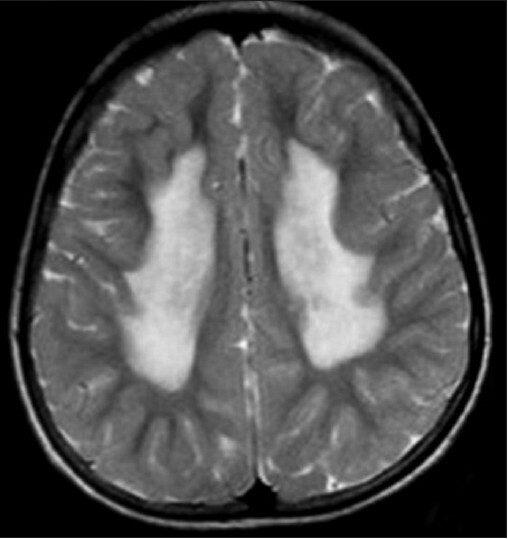 Brain MRI showed demyelination in the deep periventricular white matter [Figure 3]. The younger brother had severe spasticity and the cutaneous findings, also could not walking. 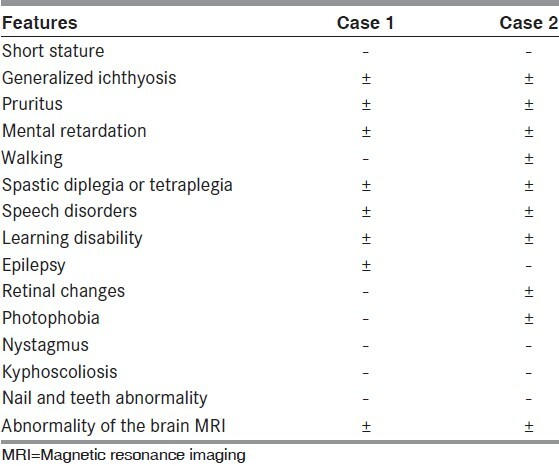 Clinical features of the patients were shown in [Table 1]. Clinical findings suggested SLS, and the mutation analysis of the FALDH gene revealed a homozygous novel mutation c. 835 T > A (p.Y279N) in exon 6. The occurrence of glistening dots on fundus examination strongly suggests SLS. Other ophthalmologic abnormalities are photophobia, macular dystrophy, and decreased visual acuity. These features are seen in one-third of cases. , The elder brother had photophobia, and glistening dots. Ophthalmologic examination was normal in younger brother. The neurologic symptoms develop later in the 1 st or 2 nd year of life. Spasticity impedes motor development and prevents many patients from walking. Mental retardation ranges from mild to profound. , Most cases with SLS have learning disability and speech disorders, as in our cases. Mutation analysis of the ALDH3A2 gene is a highly sensitive method of confirming the diagnosis of SLS. It does not require a skin biopsy or FALDH enzymatic assays. Davis et al. reported the first genetically confirmed cases of SLS. These 2 apparently unrelated patients carried the same novel ALDH3A2 mutation, but exhibited significant. More than 70 mutations are described, and these mutations are different in rich. Yis et al. reported three Turkish SLS patients with ichthyosis, developmental delay, spastic diplegia, and brain white matter disease. They identified c. 380 G > C mutation in exon 8 in two patients, and c. 228 G > A mutation in exon 5 in one patient. We detected a novel mutation (c. 835 T > A) in exon 6 in our patient. Clinical findings may be variable among siblings. Our patients had the classical triad of the disease, but the younger patient had severe neurological features, and cutaneous findings. The elder patient had photophobia, and glistening dots in ophthalmologic examination. The hallmark of SLS is demyelination of the cerebral white matter and of the corticospinal and vestibulospinal tracts. MRI reveals abnormal high-signal intensity in the periventricular white matter of the frontal lobes and at the level of the centrum semiovale and corpus callosum. , We described high-signal intensity in the periventricular white matter in elder brother, and high-signal intensity in the corona radiata in younger brother. In this report, we reported two brothers with SLS. Treatment of SLS is predominantly symptomatic because effective casual therapy strategies are not available to date; however, gene therapy studies may be successful in the future. 1. Willemsen MA, IJlst L, Steijlen PM, Rotteveel JJ, de Jong JG, van Domburg PH, et al. Clinical, biochemical and molecular genetic characteristics of 19 patients with the Sjögren-Larsson syndrome. Brain 2001;124:1426-37. 2. Gordon N. Sjögren-Larsson syndrome. Dev Med Child Neurol 2007;49:152-4. 3. Rizzo WB, Carney G. Sjögren-Larsson syndrome: Diversity of mutations and polymorphisms in the fatty aldehyde dehydrogenase gene (ALDH3A2). Hum Mutat 2005;26:1-10. 4. Dutra LA, Braga-Neto P, Pedroso JL, Povoas Barsottini OG. Sjogren-Larsson syndrome. Adv Exp Med Biol 2012;724:344-50. 5. Sanabria MR, Coco RM. Sjögren-larsson syndrome. Ophthalmology 2011;118:2101-2. 6. Uppal M, Srinivas CR, Thowfeeq KT. Sjogren-Larsson syndrome: Report of two cases. Indian J Dermatol Venereol Leprol 2004;70:110-1. 7. Rizzo WB. Sjögren-Larsson syndrome: Molecular genetics and biochemical pathogenesis of fatty aldehyde dehydrogenase deficiency. Mol Genet Metab 2007;90:1-9. 8. Davis K, Holden KR, S'aulis D, Amador C, Matheus MG, Rizzo WB. Novel mutation in Sjogren-Larsson syndrome is associated with divergent neurologic phenotypes. J Child Neurol 2012; DOI: 10.1177/0883073812460581..
9. Yiº U, Terrinoni A. Sjögren-Larsson syndrome: Report of monozygote twins and a case with a novel mutation. Turk J Pediatr 2012;54:64-6. 10. Willemsen MA, Van Der Graaf M, Van Der Knaap MS, Heerschap A, Van Domburg PH, Gabreëls FJ, et al. MR imaging and proton MR spectroscopic studies in Sjögren-Larsson syndrome: Characterization of the leukoencephalopathy. AJNR Am J Neuroradiol 2004;25:649-57.